Route 285 runs through Pecos, Texas, and Carlsbad, New Mexico and carries a large portion of the country’s oil industry along its roads. But locals have a different name for this stretch of highway that ferries supplies to and from the oilfields of West Texas. 2017 experienced a sharp increase in deaths, according to a Midland Crash Report. The report also shows a sharp increase in crashes in 2017, the beginning of the current oil boom. There were 3,755 accidents with 1,403 injuries and 18 deaths. Increased traffic. 18-wheel trucks. Driver shortages combined with a lack of safety training. All these conditions are coalescing to create a nexus of fatalities. And, as oil prices spike, so do the deaths, according to an article by the Dallas News. Truck accidents have several common causes, almost all of them exacerbated by today’s oil needs. Driver fatigue, driver error, failure to obey traffic laws, and distracted driving are the causes of many accidents. Sections of this highway also simply weren’t built for the size of trucks that now dominate the road. That reality is coupled with the fact that not all of those large trucks are that well maintained. “The Texas Department of Public Safety is aware of and seeking to resolve some of these issues,” said Sergeant Oscar Villarreal in an interview the Dallas News. For one, speed limits, that were as high as 75 miles per hour, have been lowered. More troopers are monitoring the roadways. But, especially as the number of drivers increases and funding is difficult to come by, these solutions can only do so much. A Midland Crash report details the dangerous situation – and how the deaths fluctuate in rhythm with the price of crude oil. 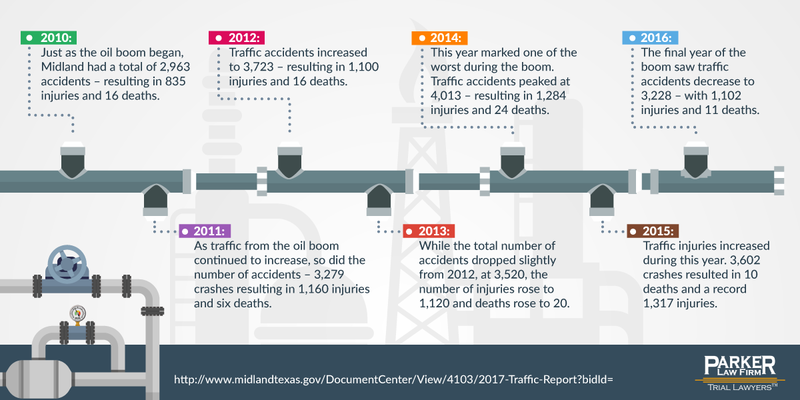 2010: Just as the oil boom began, Midland had a total of 2,963 accidents – resulting in 835 injuries and 16 deaths. 2011: As traffic from the oil boom continued to increase, so did the number of accidents – 3,279 crashes resulting in 1,160 injuries and six deaths. 2012: Traffic accidents increased to 3,723 – resulting in 1,100 injuries and 16 deaths. 2013: While the total number of accidents dropped slightly from 2012, at 3,520, the number of injuries rose to 1,120 and deaths rose to 20. 2014: This year marked one of the worst during the boom. Traffic accidents peaked at 4,013 – resulting in 1,284 injuries and 24 deaths. 2015: Traffic injuries increased during this year. 3,602 crashes resulted in 10 deaths and a record 1,317 injuries. 2016: The final year of the boom saw traffic accidents decrease to 3,228 – with 1,102 injuries and 11 deaths. Don’t speed – In congested traffic, fast stops can cause horrible crashes, such as an accident in recent years which killed an Odessa driver whose vehicle went under an 18-wheeler truck. Stay rested – Your body and your brain will react faster and more logically if you’ve had the appropriate amount of sleep. Drowsy driver is deadly, according to the AAA. Pay attention and stay off your phone – Distracted driving only makes a dangerous situation worse. Obey all traffic laws – This means following the laws about traffic signals, stop signs, and other signals in the area. Watch for blind spots – Don’t crowd large trucks, whose blind spot may be larger than you realize. Don’t drink and drive – Drunk driving is the number one cause of death on our roadways, according to Mothers Against Drunk Driving. If you are hurt in a trucking accident, don’t assume you don’t have any recourse. An experienced personal injury lawyer knows to look at factors such as the driver’s safety record, truck maintenance and road conditions before advising a lawsuit. At Parker Law Firm, our experienced personal injury lawyers believe people matter. We are committed to our clients, not case numbers, and we believe in the power of the civil justice system. With years spent both representing accident victims and participating in the state legislative process, our founder, Brad Parker, has developed a deep understanding of the law and gained unique experience that helps him get results for his clients.